Whether you’re preparing for a move, gearing up for spring cleaning or a recent fan of Tidying Up with Marie Kondo, clearing out creates a problem of it’s own. Where do all those old items go? Without Harry Potter’s ability to make things disappear, finding a way to rid ourselves of the piles of discarded items is not always as easy as it looks, especially for those who prefer not to line up the items on the curb on trash day. Fortunately, various organizations are willing to take your used items for reselling, recycling or proper disposal. If you have something of value, consider consignment shops and auction houses. They will give you a percentage of their proceeds once your item sells. Treasure House. This nonprofit consignment warehouse features upscale and vintage furniture and home decor. All profits support local agencies serving women and families in crisis. Items are accepted for consignment or donation. Leonard Auction. Leonard Auction sells antiques, collectibles and decorative objects, including furniture. They also auction off other items including jewelry, fine art, coins and electronics. Devine Consign. This consignment and resale store accepts high-end furniture and home decor items. If you’re like many of us, you may discover that while your well-loved and cherished items hold value for you, consignment shops and auction houses gently (and sometimes not so gently) inform you that your items are not worth enough to be sold on consignment/at auction. Your best next move is to accept the news with grace and find someone to take your items off your hands. Because, believe it or not, there are some items, like that old box tv in the back of your storage area, that you may actually have to pay someone to dispose of for you! While these organizations accept donations, most have limitations as to what they will accept and how much they will accept at a particular time. For example, if a resale shop already has a few couches on display in their store, they may not be able to accept your couch. Contact the organization to find out which of your items they can accept. Restoration Ministries Thrift Stores. This thrift store accepts donations of clothes, furniture, appliances and household items and offers regular pick-up services as well as estate sale, moving and clean-out pick-ups. Restoration Ministries operates two thrift stores with three goals in mind: offering residents of the south suburbs opportunities to purchase items at affordable prices, generating revenue to support their programs, and providing jobs and training for individuals with limited job experience, including residents of Harvey House and Tabitha House. The Pink Elephant. This resale shop accepts donations of furniture, kitchen items, clothing, accessories, shoes, books, records and painting. All proceeds benefit the Edward-Elmhurst Memorial Healthcare. St. Vincent de Paul Thrift Stores. This resale store accepts clothing, furniture and household items, including stuffed animals. The St. Vincent de Paul organization is made up of Catholic men and women, and proceeds from the thrift stores go to their mission to help the needy. Goodwill. This resale shop accepts donations of clothing, jewelry, household items, furniture and many, many more items, including VHS tapes, Halloween costumes and sports equipment. Another option that always means free pick up is the The Freecycle Network. List the items you want to give away on this website, and interested parties will pick up curbside. If you’re moving a great distance, you will likely not want to pay to pack up and move basic pantry items. Even if you’re moving a short distance or just clearing out the pantry, you may find food items that you know, despite your best intentions, are not going to get eaten. Check their use-by/best-by dates. If they haven’t expired, consider donating to a local food pantry. Elmhurst-Yorkfield Food Pantry accepts non-perishable food items, grocery coupons and clean grocery bags. They provide food people in need who reside in Elmhurst, Bensenville, Addison, Lombard, Villa Park, Hillside, Berkeley, and Oakbrook. What about those items that you know cannot be sold at a resale shop? Who wants to buy old soccer uniforms, broken Christmas lights, rusted out musical instruments? We know exactly where you can take all these items. And you’ll be helping people in need or saving the earth while you clean up your home! Elmhurst AYSO soccer gear. Used Elmhurst AYSO soccer gear can be donated to Soccer Gear for Zambia. In 2017 this organization shipped over 1000 items including uniforms, coach track suits, goalie gloves, balls and cleats to CHILD LIFE Soccer Academy and Rural Sports Foundation in Zambia. They will have a collection box at a local Elmhurst residence in June and will also be at the 2019 Elmhurst College Recycling Extravaganza (date TBA). For more information email Laura Stukel at laurars@usa.com and read this My Suburban Life article. Metal, Christmas lights, batteries and more. West Melrose Metal Recyclers accepts car batteries, aluminum ladders, brass instruments, stainless steel or cast iron pots and pans, steel cabinets, Christmas lights and much more. You may receive a small payment for your items. Books, LP records, school/office supplies, craft supplies and crayons. SCARCE collects used books, school supplies and crayons. Books and school supplies are given away to educators and nonprofit organizations or recycled. 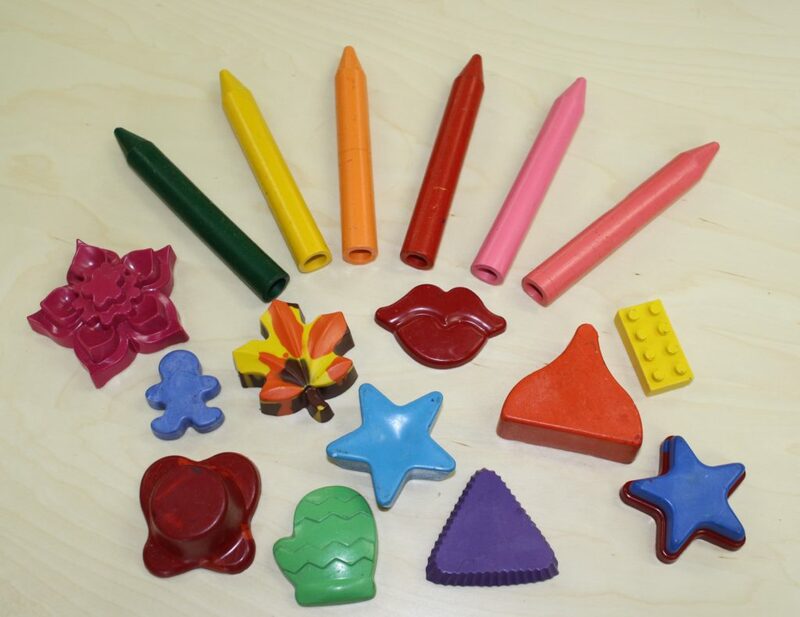 Crayons are melted and reformed into Super Crayons that can be used by children with special needs. Additional items collected include keys, yarn (like new), musical instruments, holiday lights, cords, buttons, American flags, eyeglasses, sunglasses, plastic bread tags, corks, hearing aids and Box Tops for Education. Check for events like the Elmhurst Recycling Event on January 26, 2019 from 9 am to 1 pm at the Public Works Facility (985 S Riverside Drive, Elmhurst). Items including computers, laptops, DVD players, game consoles, mobile phones, VCRs and more are accepted at no charge. TVs and monitors are collected for a fee. Tax receipts provided. Some electronics stores, including Best Buy and Office Depot, also accept old electronics to recycle. Check the SCARCE list for electronics recycling in your area. Woodridge Greene Valley Wastewater Treatment Facility collects used latex paint on particular days over the summer. Check their website this spring for dates. Various Ace Hardware locations via EPaint. Cool tip: Woodridge Green Valley also gives away recycled latex paint during the collection time period! Drop off or pick up? Be sure to ask organizations if they’re willing to come to your home to pick up the items, especially if they are larger items. Some organizationswill come to your home but will not come inside, which means you’ll need to arrange to get your items moved to your front porch or even your curb. Other organizations will come inside your home to move the item out to their truck. While some provide these “moving” services for free, others will charge you. Tax benefits. Even if you cannot sell your used items, donating can still impact your bottomline. Be sure to track your donations so you can claim them on your taxes. Goodwill provides two great resources for helping to claim your donations on your taxes. The Donation Value Guide lists items and a reasonable value to claim. Goodwill also has an online donation tracking system that helps you keep your donations organized so that, come tax time, claiming your donations is a breeze. Regardless of where you donate your items, keep a record of your donations and keep all your receipts. Hazardous materials. Visit the Naperville Household Hazardous Waste Facility website for details on how to safely dispose of aerosol cans, fire extinguishers, oil-based stains and paints, pesticides, thermostats, propane tanks, medications and other hazardous substances. Check the SCARCE list for more locations that accept hazardous waste and medications. Recycling events. Check the SCARCE list for recycling events in your area. Trash and disposal. If your selling, donating and recycling efforts leave you with a few items left to get rid of, check to see if your town hosts a free spring clean up pick up. Elmhurst residents, watch the City of Elmhurst website for spring clean up dates, usually in April. Alternatively, check with JDog Removal & Hauling. They offer free estimates for their clean out, removal and disposal services. While donations, resale and recycling are a few great ways to discard unwanted items, be creative in your efforts. There are many ways to give away items locally and personally that can be fun for you as well as the recipients. Polly Reedy, the inspiration for this article, gave her husband’s old sweaters to a friend with relatives in other countries who happily accepted and wear them. She also hosted a free give-away of old toys that her grandchildren had outgrown. Friends and neighbors and their children and grandchildren came to her garage for a fun free-for-all. Another L.W. Reedy friend had a Lego give-away when she was moving. Neighborhood children came to their driveway with empty bags and filled them up with Legos of all shapes and colors from tubs that would otherwise have been given to Goodwill or another resale shop. In all those instances, the givers felt just as warm and fuzzy as the recipients. Whether you are downsizing, upsizing in preparation for a larger family, or just clearing the clutter, cleaning out can be overwhelming. Disposing of your old items does not have to be a big project if you use the resources in this post. For more information about moving, buying, selling or Elmhurst and the surrounding community, contact your L.W. Reedy agent today. Our commitment will move you. L.W. Reedy would like to thank Polly Reedy for the creative, diligent and organized research that inspired this blog post.